When expectations for a student concert necessarily start lower than for a professional performer, it’s all the more impressive to see a group so entirely excel. I also like Mr. Sandman by the same quartet. I sang in my high school’s choir, and I’m absolutely certain I never attained anywhere near this level of musicality. The brass section has the theme… and now the basses have it… and now nobody has the theme! The audience can’t find the theme! Wait… what’s this… he’s introduced a new theme! Mengruo Yang performed a mesmerizing and technically impressive solo on flute in Fantasie Brillante from Carmen (performed here, perhaps even more impressively, by 7 year-old “Emma“). Megan Savage narrated the poem Casey at the Bat as Adam Lathram brought it to life. The Boston Pops had included this poem in their own baseball-themed concert last year, but I honestly liked conductor Allen Feinstein’s original music from tonight’s performance better. You’d better get a move on. You only have 163 measures. All this begs the question: where were you while all this was going on? I stumbled upon The Four Quarters on YouTube this morning and immediately had to play every video they’ve made. Among my favorites: Downtown, Lullaby of Broadway, and the “Teenager in Love, Lollipop, Earth Angel, Sh-Boom” medley. This overly excited departure from Zero Mostel’s impoverished and weary Tevye was already disorienting to hear first thing in the morning. It reminded me immediately of 1998, when rapper Jay Z remixed Hard Knock Life into a hip hop tune, thus taking me entirely by surprise when my rap-loving coworkers of the day loved the song without having any idea of its origin. Irked by this latest Broadway reuse, I took the time to read the rest of Stefani’s lyrics online. I wish I hadn’t. All he really wants is the luxury to sit quietly, studying and praying. What, by contrast, does Ms. Stefani (who, incidentally, has sold 40 million records) want? The Boston Pops (and the Boston Symphony Orchestra) launched a completely new ticketing system on their website last year, for which they deserve major praise. Among many subtle and useful features is the one obvious feature virtually all online ticketing applications have always lacked: the ability to see a seating chart and select specific (available) seats from it. 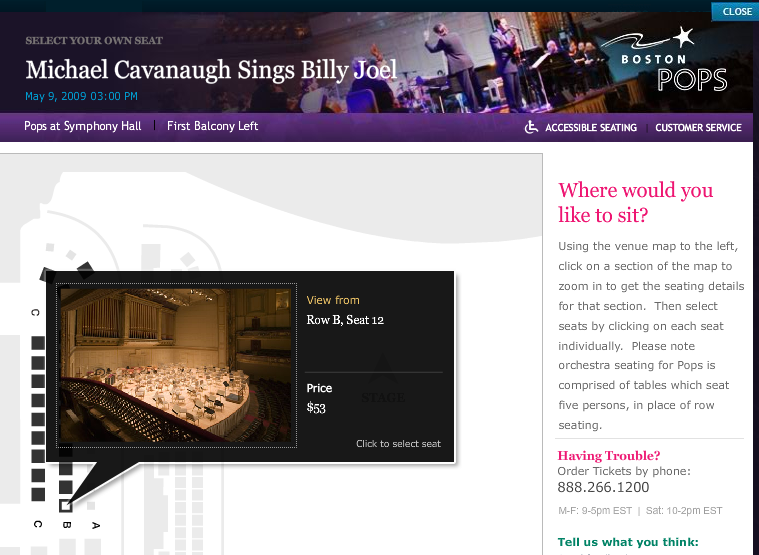 I’ve already found the perfect seats in Symphony Hall after extensive trial and error, so before this new application arrived I had to coax the old software into giving me the seats I wanted. Now I can see quickly which shows have my ideal seats, add them to my cart, and buy them. I completely approve of this new site. On the other hand, it wouldn’t accept my donation. The checkout page offers a section to donate to the Pops, the Boston Symphony Orchestra, Tanglewood, or “Education Programs.” Since I’m spending less on the Pops this year than I budgeted, I added a small donation. By the time I got to the “preview” screen, there was no trace of it. Unfortunately for the Pops, the $5.50 per ticket service fee was then added to my total, making me disinclined to try again. Now that my tickets are safely in hand (or, at least, in the mail), I don’t mind mentioning that Linda Eder will be singing with the Pops this year on June 9th and 10th. This alone has had me jumping out of my chair with excitement since I first learned of it in January. You should immediately buy tickets for yourself.